This article is about the original Organization XIII. You may be looking for the real Organization XIII or the manga chapter. The members of Organization XIII. Organization XIII (XIII機関, Jūsan Kikan?, lit. "XIII Order"), sometimes simply called the Organization, is a group of thirteen powerful Nobodies led by Xemnas, who seek to reclaim their hearts and become whole again by creating Kingdom Hearts. Although the group only has thirteen "true" members, it includes a fourteenth pseudo-member, Xion. They serve as major antagonists throughout the Dark Seeker Saga, with their members appearing in every game except the original Kingdom Hearts and Kingdom Hearts coded, and are, unbeknownst to all but their highest ranks, the main agents of Master Xehanort's own plans to conquer Kingdom Hearts. 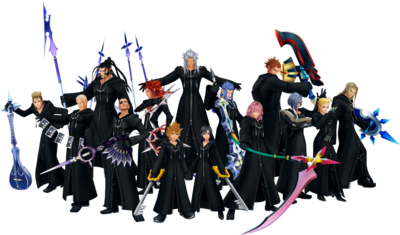 Members of Organization XIII first appeared in Another side, Another story..., and they debuted in canon through the Unknown, who serves as a boss battle in Kingdom Hearts Final Mix. The group itself was introduced in Kingdom Hearts Chain of Memories, and while the members usually serve as bosses, they were even made playable in Kingdom Hearts 358/2 Days. Because all of the members are Nobodies they lack their original hearts, and it is initially claimed in Kingdom Hearts II that this means they cannot have emotions, instead relying on acting to unnerve and toy with their opponents. The Organization yearns to discover the secrets of the heart and become full beings again by gathering hearts to form Kingdom Hearts. Despite this, most of the members begin demonstrating true emotions as time goes on, and it is eventually revealed that while they lacked their original hearts, Xemnas's plan revolved around filling the hole with replicas of his own heart, essentially turning each of them into copies of himself. Despite lacking normal emotions, or perhaps because of it, many members of the group are remarkably disloyal to its head, and much of their story revolves around key betrayals or attempted coups. From left to right: Even, Xehanort, Ienzo, Braig, Dilan and Aeleus. Ten years ago, the founding members of the Organization live in Radiant Garden as humans. Ventus encounters Dilan, Even, Aeleus, and Ienzo, who work in Ansem the Wise's castle, as his guards and apprentices. He also meets Isa and Lea, two youths who have an interest in the castle. Braig serves as a co-conspirator in Master Xehanort's ruthless ambitions, acquiring his signature scars and eyepatch following a battle against Terra. He appears at the Keyblade Graveyard to assist Xehanort, occupying Aqua and Ventus's attention. By this time, Braig houses a piece of Xehanort's heart inside himself. After Terra-Xehanort is taken in by Ansem the Wise, Braig works together with him, laying the foundations for Organization XIII. Organization XIII was formed by a group of researchers working under Ansem the Wise, the ruler of Radiant Garden, within his castle of Hollow Bastion. The head of this group was Ansem's apprentice, Xehanort, with the others being Braig, Dilan, Even, Aeleus, and Ienzo. Ansem the Wise began initiating tests about the human heart, focusing mainly on Xehanort, with the hopes of recovering his lost memories. At the urging of Ienzo, he constructed a massive laboratory under the castle. However, Ansem the Wise soon ceased his experiments, for he feared that going too deep would have grave repercussions, also noting Xehanort's apparently-superhuman abilities. However, his six apprentices, still seduced by the desire for knowledge, conducted their own dangerous experiments on countless subjects. Eventually, they discovered the beings called Heartless, those that are born from the darkness in a heart and seek others as well. Xehanort, having taken on Ansem's name and writing his findings under it, opened a door he discovered, breaking down the barriers between worlds and allowing travel between them. When a king named Mickey arrived, the six men's desire for knowledge eventually caused Xehanort to abandon his body, becoming a Heartless (though he was unusual in that he had a human form and retained his memories), with the other five soon following. Thus, the first six members of Organization XIII were born, and they banished Ansem to a Realm of Darkness. Over the next nine years the Organization increased their numbers from eight to twelve, with Demyx, Luxord, Marluxia and Larxene joining their ranks. Xemnas appears at Hollow Bastion to battle Sora, testing his abilities after just recruiting his newly created Nobody, Roxas. Marluxia orders Vexen to eliminate Sora. The neophytes, Marluxia and Larxene, try to take control of the Organization by using Sora as their puppet by manipulating his memories with Naminé's magic. The senior members assigned to Castle Oblivion, Vexen, Lexaeus, and Zexion, try to counter his plot by exploiting the powerful darkness that lays within Riku's heart. However, each group ends up being slain by heroes they sought to control, leaving Axel as the only survivor of the castle. Organization XIII slays many Heartless to finish their Kingdom Hearts, which consists of the hearts of people instead of worlds. Since Roxas and Xion are able to wield the Keyblade, they are used to achieve this goal. In the end, both leave the Organization, with Xion absorbed into Roxas, and Roxas captured by Riku. The Organization gathers at Hollow Bastion. Only eight members (Xemnas, Axel, Demyx, Xaldin, Xigbar, Luxord, Saïx, and Roxas) of the Organization remained by the time Sora reawakens. Sora and his friends end up taking every single remaining member down, save Roxas, who became one with Sora, and Axel, who sacrificed himself so that Sora and his friends could save Kairi. In the end, Organization XIII is ultimately destroyed when Sora and Riku defeat Xemnas. Following the Organization's defeat the recompleted members split in two camps; some electing to return to their Nobody state as members of Xehanort's Real Organization XIII, while others choose to assist Sora in his endeavours against the new Organization. Roxas undergoes the naming ceremony. Once discovered, a humanoid Nobody is inducted into Organization when an existing member gives them their new name. These names are anagrams of the names of their original identities, or "Others"[please confirm], with the insertion of an "X" as both a symbol that they have rejected their old identities, and as a callback to the χ-blade. The only exception to this is the pseudo-member Xion, whose name is based on an anagram of "No.i", her ID as one of the Replicas. In the naming ritual, the name of the Nobody's "other" appears before them in translucent, iridescent light, then an "X" drops down and the letters re-arrange themselves until they form a new name. The black coat of the Organization XIII. After being renamed, each member is given a uniform and a rank from I to XIII. The rank is based on seniority, and although the leader of the Organization, Xemnas, is also the rank I member, the ranks are not true measures of authority within the Organization. For example, the rank IV Vexen, a founding member of the Organization, is subordinate to the rank XI Marluxia, while the rank VII Saïx acts as Xemnas's second-in-command, right before the rank II Xigbar. 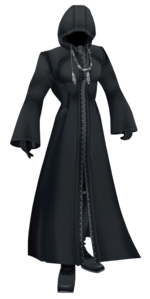 Their uniform, a hooded black coat, was chosen because it was something once worn by Master Xehanort, Xemnas's primary original persona, to safeguard him from the darkness between worlds while not cutting him off from it. It is plainly adorned with a silver zipper and seemingly decorative silver beaded pull strings for the hood that form a semi-circle in the middle. Each member wears their zippers at differing points. Underneath their coats, most of the members wear hakama-esque black pants and knee high silver trimmed boots, with the exceptions of Roxas, who wears sneakers of the same color, and Larxene and Xion, who wear a more feminized version of the boots with heels. In addition to this, they all wear lengthy black gloves. The exact contours of the coats vary from person to person. Once fully inducted, the new members are introduced to the other members at Where Nothing Gathers, the meeting chamber of the Organization deep within their home base of the Castle That Never Was. The room contains thirteen thrones, one for each member, whose height is adjustable, with Xemnas's throne being the highest. To his left are the odd-number ranked members while to his right are the even-numbered. Starting from Xemnas, clockwise, the members are Xaldin, Lexaeus, Saïx, Demyx, Marluxia, and Roxas, then Larxene, Luxord, Axel, Zexion, Vexen and Xigbar. The Organization is also represented within the Proof of Existence, a room within the castle's central tower that contains thirteen portals marked with images of each of the members' weapons. The portals lead to other rooms, presumably belonging to each member of the Organization, and the state of the portal is a mirror of its member's own state: when a member has been destroyed, their portal is rendered inactive or can even break. Members of the Organization are assigned various missions in order to hasten the completion of Kingdom Hearts. As Xemnas's second-in-command, Saïx is tasked with giving assignments to the other members. As Roxas and Xion are the only two able to harvest hearts, the other members are given other duties, such as performing reconnaissance or trying to sow seeds of darkness in order to promote good conditions for harvesting hearts. Each member is aware of their lack of emotions, and many of them pretend to have emotions. For example, Saïx battles in a seeming rage, while Larxene taunts her opponents by giggling and winking. The idea that the Nobodies lack emotions is expanded upon in the manga and novel series, which depict the members with true emotions, but explain that they are plagued by a feeling of uncertainty and emptiness due to not having hearts. The manga further displays this "plagued" feeling by showing the members engaging in tasks like jigsaw puzzles, cooking, and reading to try to fill their emptiness. 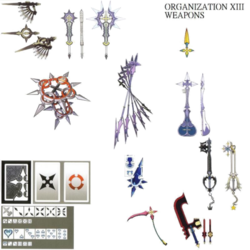 Artwork of most of the members' weapons by Tetsuya Nomura. Aside from the rank and name given to them by the Organization, each member has a unique weapon, often with a Nobody-aesthetic, as well as a title and an elemental attribute. These titles specify the role of the member, and often reference their elemental attribute or weapons as well. Most and possibly all members of the Organization also have control over a specific breed of high-ranking Nobody, although Xemnas has primary control over them should the member betray the Organization. The breeds are named after recurring Final Fantasy job classes, and mimic their Organization member's general role. Xion, the nominal fourteenth member of the Organization, is the only one without a title. Her lack of full membership is due to her status as a Replica of Roxas, meant to absorb Sora's leaking memories and eventually replace the both of them, becoming a puppet Keyblade wielder for the Organization. In Kingdom Hearts II, Sora obtains journal entries for the Castle Oblivion-based members of the Organization after obtaining the password for the DTD. In Kingdom Hearts II Final Mix, he instead receives them after defeating their respective Absent Silhouette. At least eight of the Organization members were citizens of Radiant Garden, and Sora released his heart, creating Roxas, within Hollow Bastion. ↑ Kingdom Hearts II Ultimania, Interviewer: "Previously you said 'The members of the XIII Organization have something hidden in their names', can you reveal the answer to us now?" / Tetsuya Nomura: "Before this, I've mentioned that when their names are spelt in Roman alphabets, there will surely be an "X", right? The truth is that when the "X" is taken away, the alphabets that are left behind is an anagram of the members' real names when they were humans." Translation via Maiki. ↑ Kingdom Hearts Birth by Sleep Ultimania, Interviewer: "Where did the Organization's coat and mark come from?" / Tetsuya Nomura: "One year after Birth by Sleep, Xehanort, as well as five other apprentices toss aside their hearts. Then the Nobody Xemnas was born, and the Organization which he creates take a lot of things from his memories, as a human. But as Xemnas had two people who he was, Terra and Master Xehanort, he takes from both of their memories. [...] Xemnas gives Organization members names with an X in them. This has something to do with Master Xehanort's interest in the χ-blade." Translation via Lissar. ↑ Kingdom Hearts Birth by Sleep Ultimania "...the Nobody Xemnas was born, and the Organization which he creates take a lot of things from his memories as a human... The coat used by the Organization was something that Master Xehanort originally wore." ↑ The Scenario Mysteries in "Kingdom Hearts II Final Mix+ (Kingdom Hearts II Final Mix+ Ultimania, page 502), Interviewer: "During the meetings, the members of Organization XIII are sitting in chairs. Is the height of these chairs determined by things like their skills and abilities?" / Nomura: "No, the height of the chairs is not fixated, they move. That is to say, the height is up to each person. The leader, Xemnas, is always the highest and to be at the same height as him would have a pretty bad feeling, so the other members wouldn't do that." ↑ Lexaeus's title is "The Taciturn Stalwart" in Kingdom Hearts HD 1.5 ReMIX. This page was last edited on 20 April 2019, at 15:45.